Shirts With Random Triangles: Agent for D.J. Fluker claims his client's Twitter account was hacked. Agent for D.J. Fluker claims his client's Twitter account was hacked. Deryk Gilmore, the agent of former Alabama offensive lineman D.J. Fluker is claiming that his client's twitter account was hacked early Tuesday morning. This comes after a tweet from the account appeared in which had Fluker "confessing" to being paid while at Alabama. It only took a little more than an hour before Gilmore tweeted that his client's account had allegedly been hacked. 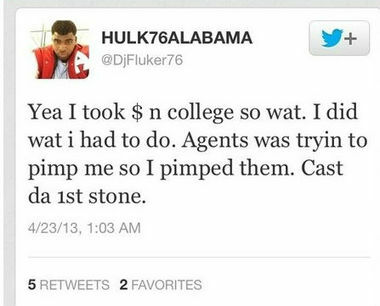 To all followers of @djfluker76 his account has been hacked. We will re-activate his account soon. Thank you for your support. The alleged hacking occurred after Auburn released the report from an internal investigation claiming that accusations of NCAA violations in a internet article by Selena Roberts were false. Take that as you will.